We bring forth vast industrial experience and expertise in this business, involved in offering a high-quality range of Seamless Tee. 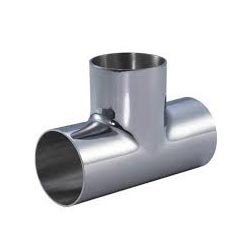 Seamless Tees a wide range of tees made of exotic metals, nickel, nickel alloys, Stainless Steel etc., of various grades. Tees are manufactured as Equal tees and Reducing tees. Equal tees are exactly that, all three ends are of the same size. Reducing tees come with a combination of different outlet sizes. Forged, seamless & welded tees of types equal tee, reducing tees to ANSI B 16.5 from classes 2000 to 9000 and Schedules from 10 to 160 and tees accordance with BS standard from classes 2000 to 9000 lbs, Schedule 10 to 160. Range: 8 NB upto 150 NB. Alloy Steel Grades: ASTM A WP1/ WP5/ WP9/ WP11/ WP22/ WP91 etc. 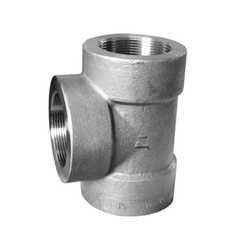 MS Tee, Size: 1/2" to 20"
Thread Size: Weldable Tee 1/2" to 4"
We are offering Tee to our clients.